Updated, 8:38 a.m., with comments from the RNC. Presidential hopeful and U.S. Sen. Bernie Sanders (I-Vt.) delivered his signature stump speech in the heart of Macomb County on Saturday, railing against establishment Democrats, President Donald Trump and America’s wealthy elite to a crowd of hundreds of supporters. Sanders, like other candidates in the 2020 presidential race, is betting early on the Midwest — and Michigan — being part of their victory path. But beyond Trump-bashing, Sanders had a message of hope: a government based on unity and economic, racial, social and environmental justice. And it will be nothing short of “our political revolution,” Sanders said. 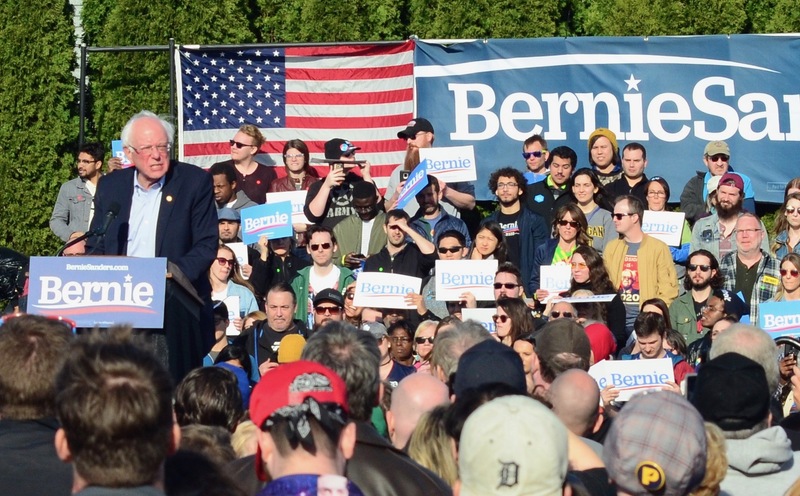 “The underlying principles of our government will not be greed, will not be kleptocracy, will not be based on hatred or lies,” Sanders said to a cheering crowd at Macomb Community College. “The underlying principles of our government will not be based on racism, sexism, xenophobia, homophobia or religious bigotry. Those are un-American sentiments — and together we are going to end that mentality. The principles of our government are gonna be based on what we believe in our hearts, and that is justice. “Justice is a profound belief which must motivate us every single day. We’re talking about economic justice; we’re talking about social justice; we’re talking about racial justice; we’re talking about environmental justice,” Sanders continued. Trump featured heavily during much of Sanders’ speech. The presidential hopeful also said many of his ideas were considered radical just a few years ago, but are now more mainstream. Sanders ticked off tuition-free college, publicly funded elections, seizing back corporate power in electoral politics and a nationalized single-payer health care system. If elected president, Sanders said he intends to “bring austerity to large corporations,” stop companies from moving U.S. production abroad, create a single-payer health care system, raise the national minimum wage to $15 an hour, undo Right to Work laws, legalize marijuana and fight climate change. To do so, Sanders vowed to take on parts of the Democratic Party and political establishment, Republicans, “corporate America,” Wall Street, insurance companies and drug companies. The message resounded with the crowd in a county that Trump flipped red in 2016. Macomb was one of 12 Michigan counties had voted for President Barack Obama in 2012 before turning red for Trump. Sanders won Michigan’s Democratic primary election in 2016, besting eventual nominee Hillary Clinton. In 2018, now-Gov. Gretchen Whitmer won Macomb County in both the Democratic primary and the general election. The county is emblematic of the role that Michigan may now play in the 2020 election. Michigan is widely regarded as a major battleground state, along with Pennsylvania and Wisconsin. Macomb Community College has been a popular stop for politicians in the past, as well. Trump held a rally there before his March 2016 GOP primary victory. Former President Barack Obama pitched his free community college plan here in 2015 along with then-second lady Jill Biden, wife of likely 2020 presidential contender former Vice President Joe Biden. The Republican National Committee bashed Sanders on his agenda, including the Green New Deal and getting rid of private health insurance. Sanders made a stop earlier Saturday in Coopersville and stopped in Detroit after his Warren event. He’s the latest candidate to come through Michigan. Trump kicked off his 2020 re-election campaign in Grand Rapids at the end of March. Democratic candidates like former U.S. Rep. Beto O’Rourke (D-Texas) and U.S. Kirsten Gillibrand (D-N.Y.) have made stops, as well. Sanders was introduced by Abdul El-Sayed, a 2018 Democratic gubernatorial candidate who lost to Whitmer. El-Sayed was a 2016 Sanders supporter and the senator returned the favor by endorsing him late in the primary. Sanders’ message resonated with several voters at the rally Saturday who spoke with the Michigan Advance. “I really like him. I like everything he’s for: health care, women’s rights, just everything. We need a change,” said Amy Millan, who said she lives in Oakland County. Daniel Alfafara, 70, said he was also a 2016 Sanders supporter. The retired autoworker from Warren said he felt Sanders wasn’t treated fairly by the Democratic Party last election. But Alfafara said he’s still waiting for the right Democratic presidential candidate this time, citing concerns about Sanders’ age. Michael Gerstein covers the governor’s office, criminal justice and the environment. Before that, he wrote about state government and politics for the Detroit News, the Associated Press and MIRS News and won a Society of Professional Journalism award for open government reporting. He studied philosophy at Michigan State University, where he wrote for both The State News and Capital News Service. He began his journalism career freelancing for The Sturgis Journal, his hometown paper.